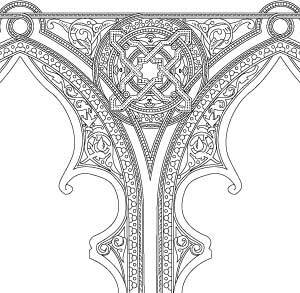 Think of these as a part of a coloring book. Dresser included a number of black & white ‘skectches’ in Studies in Design and Modern Onamentation. We are offering 3 of these designs; just the black outlines so you can customize with your own color combinations. (Hint: Live Paint works nicely for this!) One of the designs offered is an Illustrator pattern brush and the other 2 are AI and EPS motifs that have a linear repeat but they are not rendered as brushes–we’ll leave that up to you. 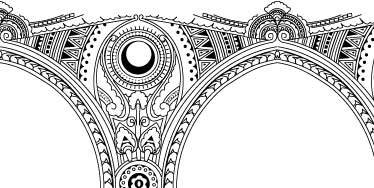 The full Dresser Coloring Book will be available for purchase and will include selections from Studies in Design and Modern Ornamentation. The elves are busy working on the designs now. We anticipate offering Series 1, consisting of 25 to 30 designs, by the end of the year. 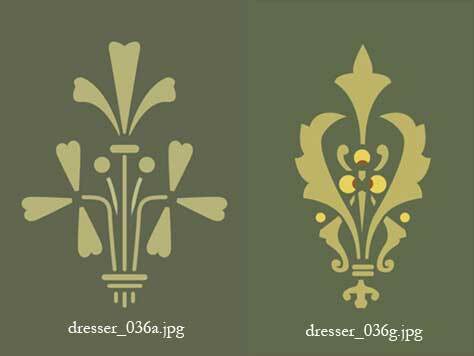 As promised, here are two more samples from the Christopher Dresser: Studies in Design motif collection. Designs are “hand” traced and in full color. The plates used as the tracing source have faded so the colors may not be an exact match to the original. Colors are rendered in RGB mode which provides the widest gamut for the closest match. Files are fully customizable (colors, proportions, shapes, etc.) using Illustrator. As vector drawings, the designs are fully scalable so they can be adapted for use in websites or for print. Color rendering can be changed to CMYK if needed for printing. Files are available in Illustrator .ai format (including pattern swatches and pattern border brushes). Non-repeatable motifs are also available in .eps format. 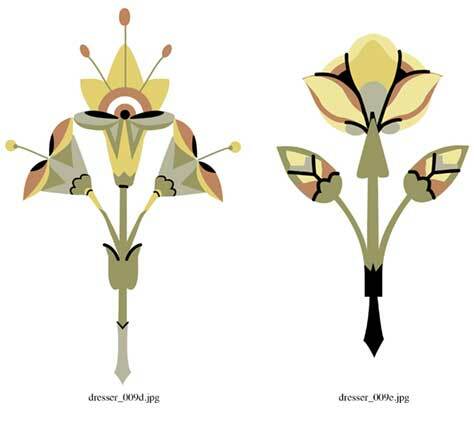 These free examples are part of larger collections that can be purchased. The catalogue of currently available collections can be found in the Marketplace (in the right sidebar). Both the Marketplace and the collection of free samples is growing, so bookmark this page. Be sure to check out the previously offered free samples from this collection. 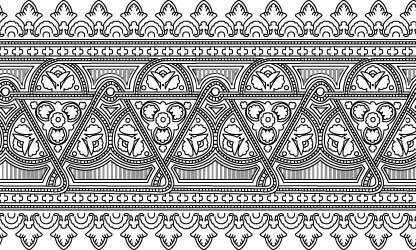 Every so often (though probably not on a set schedule) I will post free downloads of vector design motifs, patterns, borders, taken from decorative arts sources of the late 19th and early 20th centuries. Some of the designers represented: Rene Beauclaire, Christoper Dresser, Eugene Grasset, Owen Jones, William Morris, Auguste Racinet, Maurice Pillard Verneuil. Charles F.A. Voysey, as well as lesser-known designers. Designs are ‘hand’ traced and in full color. The plates used as the tracing source have faded so the colors may not be an exact match to the original. Colors are rendered in RGB mode which provides the widest gamut for the closest match. Files are fully customizable (colors, proportions, shapes, etc.) using Illustrator. As vector drawings, the designs are fully scalable so they can be adapted for use in websites or for print. Color rendering can be changed to CMYK if needed for printing.